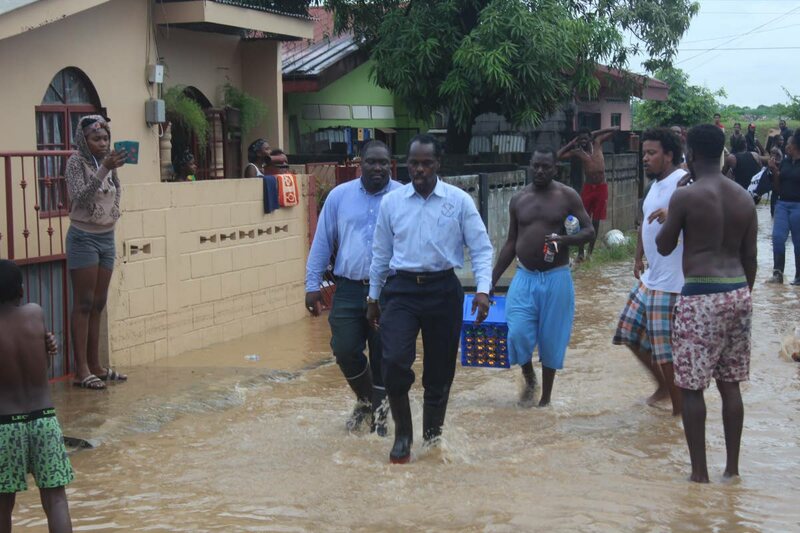 Hinds, during a visit to Beetham Gardens last Tuesday, was doused with flood water as he toured the affected. Both Hinds and Audain were then chased out of the area. Following this, a Beetham resident and political activist Anderson Wilson said the actions of the residents was the culmination of their dissent towards the PNM. Residents subsequently apologised to Hinds. Police are now searching for at least four men believed to be responsible for the unprovoked attack. Speaking at a drain clearing exercise off the Beetham Highway yesterday, Hinds told the media he was sure that “only a few miscreants” were responsible for the attack on him and, therefore, he was not angry with the community. “Don’t blame all of Beetham, don’t think its all of them. It’s a handful of misguided people who feel they can bully their way through everyone in this society,” Hinds said, adding Government was neither afraid of them nor would it be distracted by them. Later in the day at the press briefing following the PNM General Council meeting, Hinds said the issue was raised and both he and Audain were praised for their handling of the situation. He emphasised that the attack was a “side show” and the main concern was the clearing of the watercourse to stop the flooding that happened in the community on July 1, and August 13 and 14, from re-occurring. “I don’t hold any ill will. When I see ignorance I recognise it for ignorance and stupidity. In this case it was also illegal and the police will deal with that. Malice and all these things I do not carry, I want everyone to know that I am a man and I did not enjoy being assaulted like that and I leave the rest to God and the police,” Hinds said at Beetham yesterday. Hinds said the police contacted him after viewing the incident and he gave a statement and he would be co-operating with them fully. Asked if he or the party was concerned that him continuing with the police action might continue to erode the relationship between him and the residents, Hinds said that was a matter for the future but, for now, he was fully co-operating with the police in their investigation. Hinds said the flooding that took place that led to his assault was the making of of some Beetham residents, who the Friday prior, chased a contractor out of the area. With the assurance of protection from the police and the regiment, the contractor returned yesterday and resumed work which is expected to last a week. The cost of the project was not disclosed by either Hinds or Works and Transport Minister Rohan Sinanan, who said the work was contracted under the bonded contracts which is based on a fixed price. Hinds said following the assault, he had been hearing derogatory comments towards his constituents and lamented that it was unfortunate that his people were being stigmatised. Reply to "Govt not afraid of bullies"